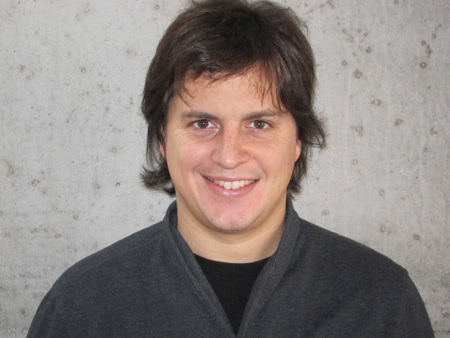 Initially created to solve an issue he had as a video game designer, Mariano Suarez Battan, CEO and co-founder of Mural.ly, has come up with a visual solution to organizing and making of a record of visual creativity and connections with his startup. Content from blogs, news sites, Flickr, YouTube, and other sources can be collected on Murally page which also acts as a way for other to interact with the page and give feedback among a number of users. It’s a visual aid to share ideas in a shared web space. It can be used for various forms of design, simply brainstorming, as a teaching tool, or a story telling platform among other uses. Who do you see as the primary users as Mural.ly and how do you think this type of visual organization will impact the way things are done? Well, in on the one hand there’s the solo approach to visual mapping so that’s one type of user – just one person. When you map things spatially your brain makes connections that help you remember and find new patterns. However, when in groups, visual brainstorming is the queen: it empowers creativity because it’s all about visual construction. It’s also good to shorten the gap of understanding when trying to share an idea. When did you first come up with the idea for Mural.ly and how long did it take you from that moment to hire the core members of your team? When I was creating game ideas I always found myself looking for inspiration and then cluster it inside a Powerpoint deck. That felt weird because I was forced into a linear structure and I also lost the online references I was using for my ideas. After leaving the company I spent some time relaxing and then came back around 4 months after and started assembling the team. In what way has your previous experience specifically informed what your goals are with Mural.ly? 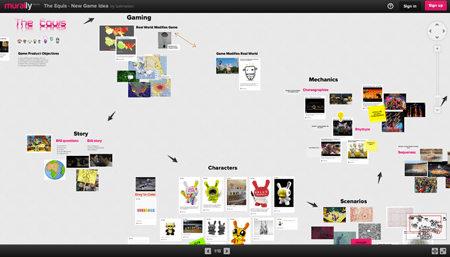 A lot of what we are doing in Mural.ly comes from videogame user interfaces. I think the web has a lot to inherit from that. 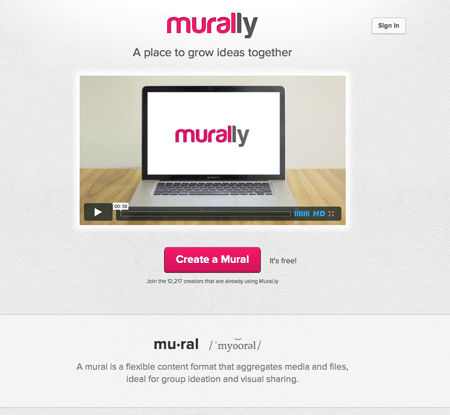 In what way has Mural.ly evolved from when you first began working on the idea to how it functions presently? We flirted with the idea of going photo-sharing first but realized we had a bigger vision when we went for information and idea creation and sharing in a broader sense. We want to make the world a better place! How did you go about funding Mural.ly and how have you found the funding process to be? Can you tell me what your daily routine currently involves Monday through Friday? It’s a fun mess! Product design, customer development, going out and talk to groups, keeping investors updated (not that much, they are nice), building relationships with potential partners, checking out cash-flow, dealing with office stuff, overseeing finances, admin, taxes, and pinching my partner on tech issues to make sure we are cool… and then I have an amazing wife and kid… and I also need to keep fit. What it’s like working with your team at Mural.ly? What advice would you give someone interested in launching their own startup? Just do it. A lot of people see a big hill they need to climb first to start. That’s BS. Think big, but cut that mountain in little pieces and prototype those parts. You can even “mock-up” your startup with a piece of paper being a user interface. No excuses, just make sure you are trying to solve a problem or making the world a better place. When you’ve time, how do you like to relax and step away from Mural.ly? I like sports a lot. I also played with my very amateur rock band. I also like to travel for fun, but that’s a bit harder now. What is your primary motivation? Work-wise: I want to make something that a lot of people use regularly as part of their lives to make it simpler, better, exciting, and richer… whatever. When you have created something in the past that was used by more than 20 million users… you miss that feeling of getting praised AND cursed by a big group of people that get marked by your creation for life. Personally: now that I am post 30, I appreciate life much more and am enjoying being a husband and father a lot. It gives more meaning to things. Although I still work a lot and it’s hard to turn off my brain and come back to reality. How can your readers get in touch with you? I regularly tweet @batmelon and I’m pretty accessible in general. You can also easily guess my email, but let’s not publish it because of those spam robots.